Microsoft’s Kinect peripheral has only been on the market a couple of years, but its phenomenal sales in that short space of time is testament to how much we love that kind of interaction with our consoles. Wouldn’t it be wonderful, though, if that same ethos was applied to PC or Mac? 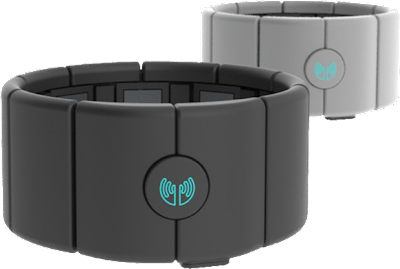 The MYO, a peripheral created by Thalmic Labs, makes this a reality by allowing simple gestures to be used in controlling a computer or notebook. It is strapped around the arm, just below the elbow, and offers a deluge of different controls. One can, for example, slip through pages on a document by swiping in the air with two fingers, pause something by making a clenching gesture, or even play a favorite FPS title by pretending to lift a gun from over one’s shoulder. They are in limited supply, so don’t wait around if you would like to take the gesture’s you’ve learned on the various consoles and apply them to your computer. Shipping is expected to begin later this year. Online payments startup WePay is expanding into new territory today with the launch of a new native app for iOS that allows small businesses to invoicing and charge credit cards on the go. The Y Combinator-backed startup originally formed to make it easier for groups to collect money and make payments together. But recently it pivoted slightly to become ultra-simple platform for businesses to collect and manage payments online. It’s added support for event registration and ticketing, custom invoicing, donations, and e-commerce. Last year, the startup rolled out a white-label payments API and lowered its prices to court third-party developers and debuted an easy way to embed in-line payments. While Square, PayPal and many others, are focused on allowing merchants and individuals to accept and swipe credit cards, WePay’s app is centered around more of a niche area—allowing those small businesses who send invoices to be able to accept credit cards within the app. Both invoicing and credit card processing cost 2.9% + .30¢ per transaction, and all cards are accepted. The invoicing aspect is key, says founder Bill Clerico. The user experience of the app is really centered around businesses, such as marketers, contractors, designers and others, who send professional invoices on the go, and want to also accept payments via these invoices. In terms of credit card acceptance, the app just asks for the user to manually input the credit card info and the card is charged. Clerico explains that WePay looked at developing hardware but didn’t think that developing this was the right fit for the company at the time, Over time, WePay may explore this area, he adds.